Tidbit no. 1: Steven Meisel is shooting its fall campaign. Ever since Stuart Vevers debuted his first ready-to-wear collection for Coach at New York Fashion Week in February, the label has been full steam ahead with a brand repositioning that it hopes will take it in a more fashion-forward direction. On Thursday morning, Coach gave its investors a full (four-hour long) rundown of the specific ways in which it&apos;s hoping to pull off the revamp, which will be put to the test when Vevers&apos; designs hit stores in September. According to CEO Victor Luis, "modern luxury" is the concept at the heart of Coach 2.0. It&apos;s one of those vague brand terms, so defining it is something of a workaround. "Modern luxury" stands in contrast to the "accessible luxury" that Coach currently embodies. It&apos;s not about copying European luxury houses or jacking up prices. It&apos;s about (Luis&apos;s words) "quality, craftsmanship and the lasting relationships we establish with consumers." Hope so. The change is going to be most apparent in Coach&apos;s North American women&apos;s accessories business, which Luis notes has failed to keep up with changes in the market. Above all, Coach is now about leather, not stacks of "C" logos. Still, Vevers says that a lot of Coach&apos;s "codes," or signature design details, will carry over into the new bags. That includes the metal turn lock closure, hang tags and horse and carriage logo (which happens to transcend the English alphabet -- hello, China). Vevers wants the new Coach to be "cool and un-elitist" with a level of functionality, a promise on which the new leather goods do seem to deliver. 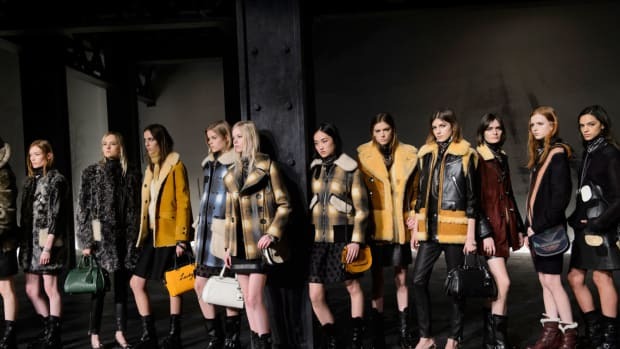 Add in the designer&apos;s well-received Fall 2014 collection and a Steven Meisel-lensed campaign slated to drop in September, and the odds of Coach establishing some measure of true fashion cred are looking pretty good. To that end, Coach has also gotten the endorsement of some major fashion retail partners, chief among them Colette in Paris and Net-a-Porter, which will start selling its products in July and August, respectively. In order to tighten its own in-store image, the brand is closing roughly 70 of its underperforming North American locations over the course of fiscal 2015 in favor of investing in its flagships in its 12 major metropolitan areas. Sales will be limited to a semi-annual schedule focused around the holidays, in order to curb the brand dilution that comes from too much promotional activity. Globally, Coach considers China and Japan its two biggest growth opportunities outside of the U.S — China especially, given that consumers there are shifting their buying priorities and becoming less into luxury brand names and more into quality product. That said, Coach also has new flagship openings planned for Paris, Milan, Sydney and Melbourne; Europe represents the biggest white space in its international strategy. It&apos;s a lot to digest. The company appears to have a lot of internal momentum going as it prepares for its big debut in September. The big question is, will it be a home run with shoppers?